For those who are interested, please check out the blog for my latest film Stained Glass Rainbows... exploring the bed wrestle between homosexuality and faith. In this film I bravely go where few Christians dare to tread... to gay pride parades, to the living rooms of gays and lesbians, to the depths of the struggle between conservatives and liberals... asking questions like, "is homosexuality a sin?" Hear from the lesbian minister, the ex-lesbian who fled the country with her little girl, the gay pastor who wanted to pull the trigger and end it all, the ex-gay man living with AIDS, the conservative theologian who explains the biblical standards, the God Hates Fags protestor, the man and woman ministering to the homosexual population, etc. 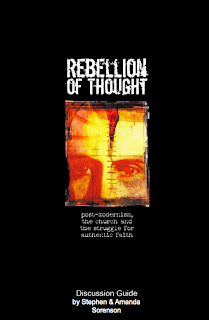 Finally... the Rebellion of Thought Discussion Guide has been published to the website... 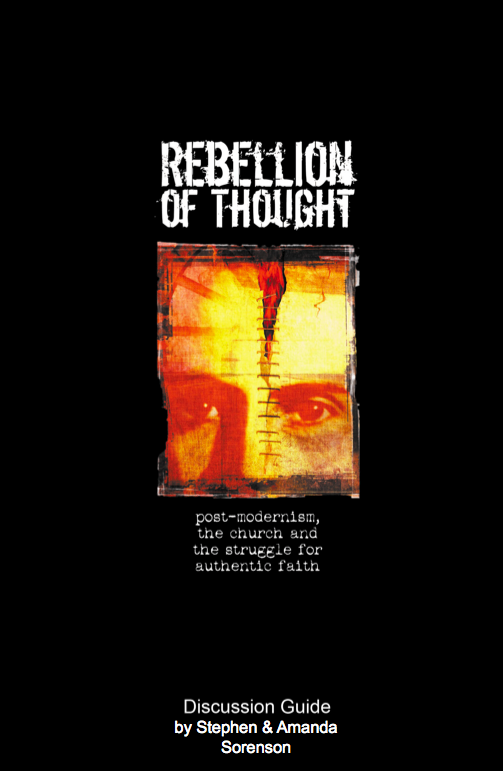 Check it out at www.RebellionofThought.com. This is the perfect thing if your small group is watching the film. It works with the Group Viewing Segments on the DVD and is designed to help make a lot of the heady stuff in the film more understandable and to give people something to guide them through the jungle known as Rebellion of Thought. It's written by Stephen & Amanda Sorenson... they've written numerous study guides for some big name folks. and best of all... it's FREE! Allow me to start by saying This Is My Body is FANTASTIC! And I’m not just saying that because I’ve known the author for nearly 25 years. I say it because This Is My Body is a much needed treatise about the state of the church in North America. As most of those who claim to follow Christ know, the church is not made of brick and stone, it is made of spirit, of flesh, of bone... for the church is made of nothing more than the Spirit of God dwelling in those who seek Him. 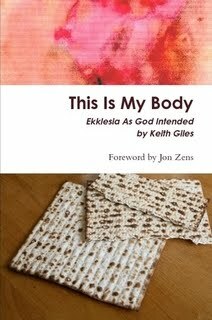 How His followers connect with each other is the essence of the greek word Ekklesia and the topic that Giles explores within this book. Giles reminds us that one of the most mind-blowing elements of the crucifixion of Christ was the mysterious tearing of the temple veil. Prior to that historic event the high priest alone had access to the Holy of Holies. Only on special occasions could he enter the dwelling place of God behind the veil, which had to be an amazing event for the lone participant. But the symbolism and substance that springs from the torn veil is even more amazing... that we all can now approach the One who for so long was unapproachable. Giles asks the question, will anyone dare pick up a needle and thread to repair the torn veil? It's obvious that only an extremely arrogant person would attempt such a thing, but unfortunately the institutional church has had their share of such men who desperately attempt to repair the veil, mainly because their livelihoods depend on it. The days of "Professional” Christianity are over! The Holy Spirit is reclaiming it for the common man and Keith Giles is helping to blow the trumpet! I can hear pastors of the institutional church screaming "heresy" as they desperately cling to their salary, their staff, and their beloved "book funds"! My hope is that This Is My Body will become required reading in seminaries and bible colleges across the land. Unfortunately, it's more likely that it will be added to the bonfire by the hoity-toity elite who see their security being threatened. As much as I loved reading This Is My Body, it is not perfect. There is one missing chapter of this book, which should be called Exit Strategy. Giles does a great job setting up the problem with the typical top-down church structure in America, but I would have liked to see a section devoted to helping people move from the comfy pews of “spectator Christianity” into this brave new world where the only safety net is the Holy Spirit. A chapter where the reader could gain valuable information on how to leap from the train known as the institutional church... a train that, as my brother and I pointed out in our film Rebellion of Thought, is tragically on the wrong track, barreling blindly toward the wrong destination. (I might add that Rebellion of Thought didn’t offer that type of help either!). When the Sunday Morning Business Men take to their pulpits to drone on-and-on "teaching the Word of God", my prayer is that the brave few who get their hands on This Is My Body will move out into their communities and neighborhoods "living the Word of God", being Christ to those who need it most. Only then will we experience the sense of Ekklesia that our New Testament brothers and sisters knew so well.